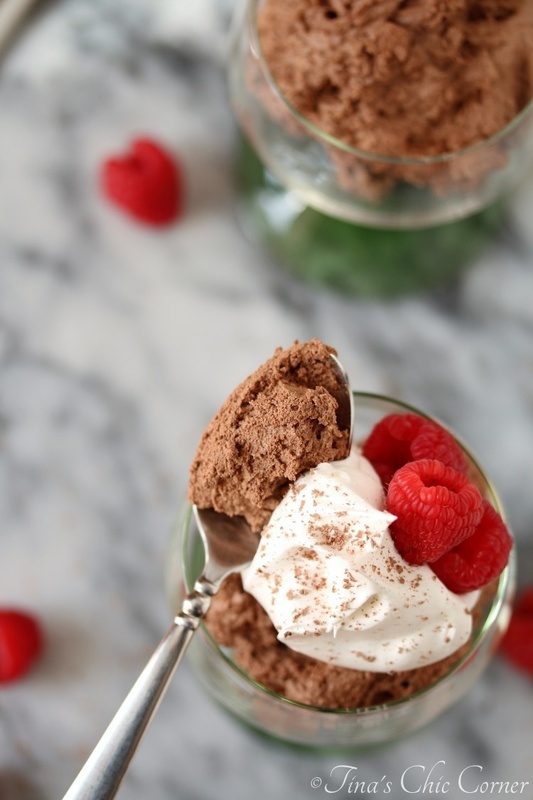 I have made this chocolate mousse so many times over the past few years and it came out delicious every time. I shared this recipe with you a couple of years ago. At that time I fancied them up with a graham cracker cookie crust and homemade eggnog whipped cream. The other night I was supposed to have three girlfriends over for dinner but two of them cancelled last minute because it snowed. One of them was supposed to bring the dessert. I had about two hours to figure out what to serve to the one who braved the snow. I suppose I could have defrosted some cookies that I had stored in the freezer, but I wanted a “real dessert.” (Cookies are like a pre-dessert. 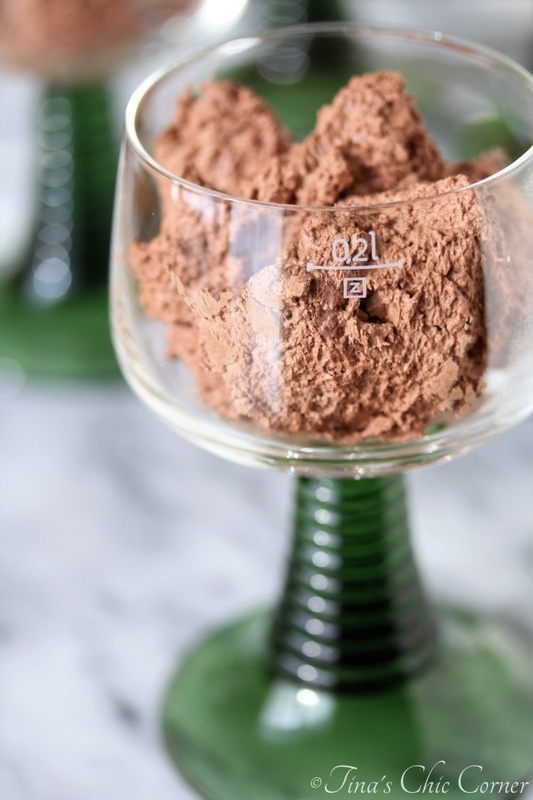 😉 ) I looked into my recipe vault and remembered this chocolate mousse. I literally whipped it up in 10 minutes. However, I was running on loads of caffeine at that time so let’s just call it a 15 minutes for those of us running at a normal pace. 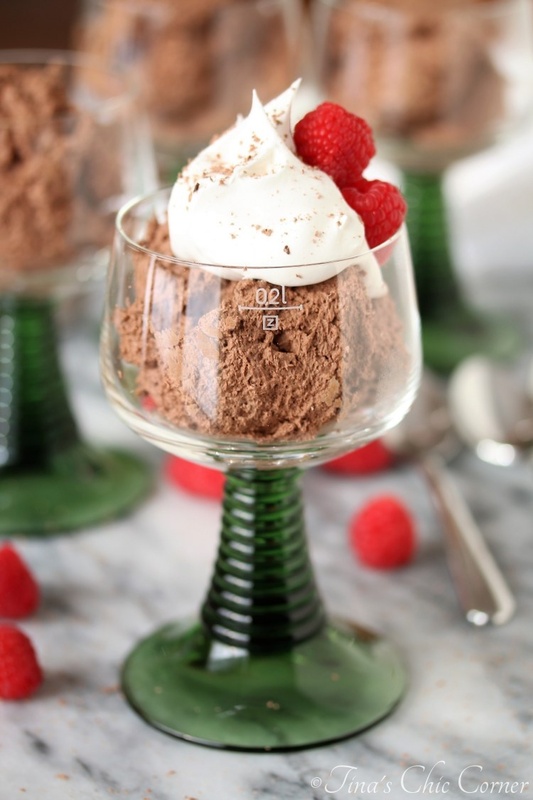 I served the mousse with store bought whipped cream, a few raspberries, and grated chocolate. I sort of felt like I was cheating by serving something so simple, but my girlfriend couldn’t stop raving about it. That stopped the guilt for me. I was happy that she enjoyed it, but I was probably more impressed that I could come up with a successful plan B so quickly. We hosted a second dinner party the next day for family. Guess what I made? If you guessed the same chocolate mousse then you’d be right. Although truth be told, I was mostly sold on the fact that it was quick and easy to make because I was pooped by this point. Entertaining is a lot of work, especially when you’ve double booked yourself in the same weekend. 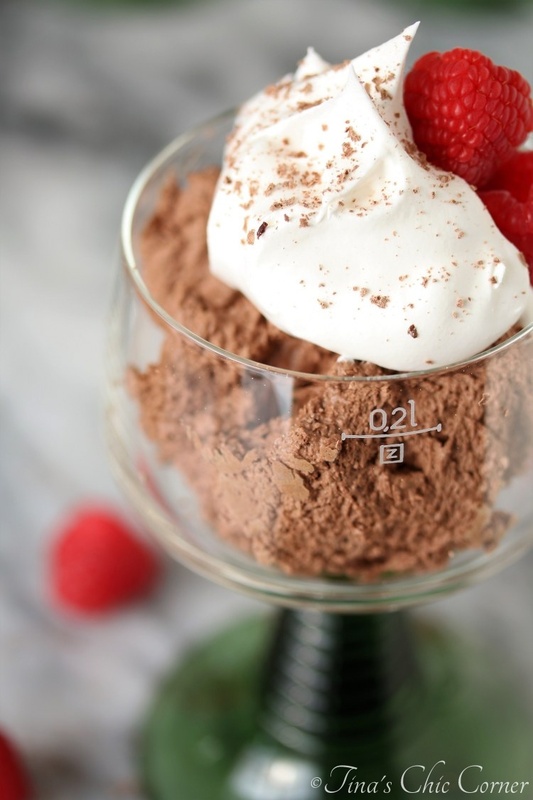 I recommend taking the mousse out of the fridge about an hour or so before serving so that the mousse is softer. You can also enjoy it straight from the fridge and my girlfriend actually preferred it that way. The mousse will be more stiff in that case, but still equally tasty. In a large microwave safe bowl, add the whipping cream. Microwave it on high for 1 to 1 and 1/2 minutes or until the cream comes to a boil. Add in the chopped chocolate and stir until it’s completely melted. Let it cool for about 5 minutes or until the mixture comes to room temperature, stirring occasionally. Gently fold in the whipped topping until it’s well blended. If you are serving it right away, divide it into cups and serve. If you are serving it later, divide it into the serving cups and then put them into the fridge. Tina, too funny I have the same green stemmed glass! Great minds surely think alike. Can’t wait to try it out on my chocolate loving husband! It sounds super easy. Marie, I can’t believe that you have the same glasses! You have great taste. 😉 I also have the 2.5L size too. I don’t use them often… maybe because I’m afraid they’ll break. Hehe. I hope your husband loves the mousse! My kind of recipe – just a few ingredients! I’m going to try it on my mother this weekend. Thanks for posting. How lovely! I hope your mom loves it as much as my family does. 🙂 Have a happy holidays!